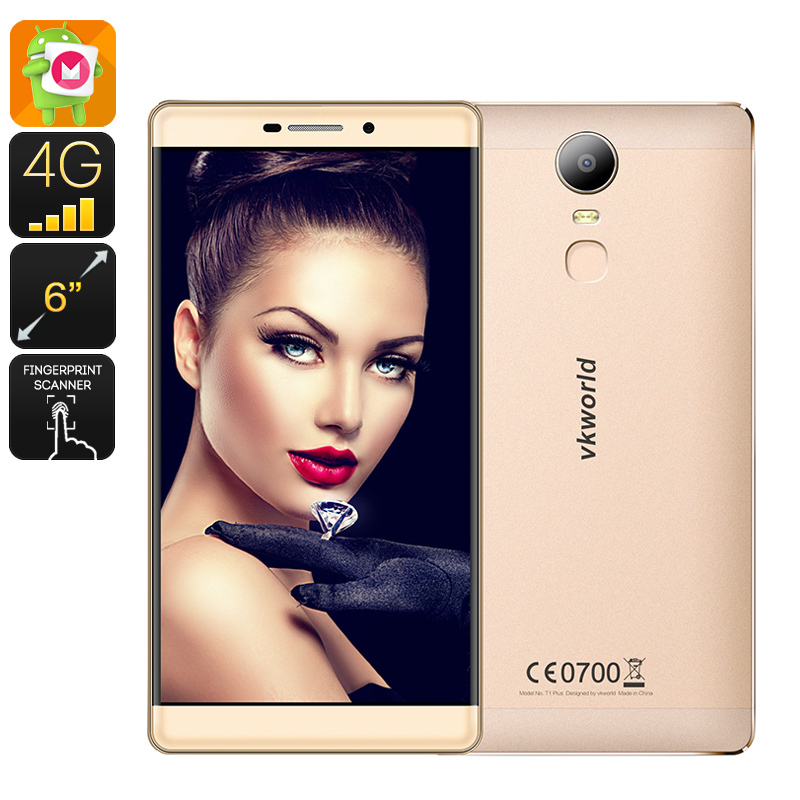 Successfully Added VKWorld T1 Plus Kratos Smartphone - Android 6.0, 4G, Dual IMEI, 6 Inch, Gorilla Glass, Free Cardbox VR Glasses (Gold) to your Shopping Cart. With its sleek and well-crafted design the VKWorld T1 Plus Kratos smartphone is a true feast to the eye. Crafted out of one single piece of aerospace grade aluminum this Chinese smartphone resembles the finest craftsmanship and has a truly artistic design. Along with its large 6 inch phablet sized HD display this Android phone is guaranteed to turn some heads. Featuring the latest Android 6 Operating System the VKWorld T1 Plus Kratos is a smartphone that lets you enjoy the latest features that the mobile industry has to offer. Its powerful MTK6735 Quad-Core CPU that has been backed up by 2GB of RAM provides you with enough power to enjoy the latest games and movies alike in stunning detail, offering an immensely smooth user experience without any lag. Download the latest Apps, games, movies, and more in the Play-Store and enjoy countless hours of mobile entertainment. With 16GB or internal memory and up to 32GB of external storage there is no need to worry about running out of storage space for your favorite media files any time soon. Holding a massive 6 inch display this Chinese smartphone lets you enjoy vivid colors, wide angle view, and provides an unlimited viewing experience. Combined with its HD resolution it feels as if you are holding your own portable cinema in the palm of your hand. Covered by 2.5D Corning Gorilla Glass the display of the VKWorld T1 Plus Kratos is extremely durable and protected against everyday impacts and scratches alike. Providing you with two IMEI numbers and Dual-SIM slots, this Chinese Android Phone allows you to be connected to two separate 4G network providers simultaneously. Enjoy the fastest mobile data connectivity out there and always be within reach of your colleagues and loved ones. With the VKWorld T1 Plus Kratos you will constantly be up to date and connected to the outside world. Enter the stunning and breathtaking virtual world of 3D games and Virtual Reality. With some simple moves the packaging box of the T1 Plus Kratos can be turned into a budget style VR box comparable to the Google Cardbox Glasses. No longer will there be the need to invest hundreds of dollars into the latest VR glasses - with the T1 Plus Kratos you will be able to enter the endless world of Virtual Gaming and it won’t cost you a single dime. Packing a massive 4300mAh battery this Android phone provides you with a continuous usage time up to 12 hours, enough to enjoy numerous 3D movies in a row, or to drift away in an entirely new virtual world of 3D gaming, without the need to recharge anytime soon.